Hurricane Sandy wreaked havoc on the East Coast on Monday, making it one of the most devastating hurricanes ever to hit the region. In its wake, it left more than 7 million people without power and a death toll of 33. We compiled images from our staff, readers and wire services to give you a picture of the historic storm and its aftermath. Reader Debra Bilal shares an image of the flooded tunnel that connects Brooklyn to Manhattan. Reader Laini Brown sent us this picture of a fallen tree lying across 154th Street in Harlem. Reader Michelle Walsh shares a photo of a restaurant's awning on the ground in Brooklyn. Reader Steve Jones captured this image of the extent of the hurricane's damage in northern New Jersey. The Root's editorial assistant, Joshua R. Weaver, snapped a photo of a large tree uprooted in front of his Brooklyn apartment. A tree is downed in Fort Greene Park in Brooklyn. The Root's editorial intern, Celeste Little, took a picture by her parents' home in Chelsea. As night fell, everything south of 25th Street and 7th Avenue went dark. Police officers were out directing traffic. Reader Debra Bilal shares a photo of Rockaway's Boardwalk post-Sandy. A resident and other family members are taken by truck away from their flooded home in Atlantic City as Hurricane Sandy moves up the coast on Oct. 29, 2012. The family said the water kept rising at the home and they were able to wave down a passing truck to pick them up. Cars floating in a flooded basement after Hurricane Sandy on Oct. 30, 2012, in the Financial District. A man surveys the remains of a flooded store after Hurricane Sandy on Oct. 30, 2012, in the Financial District. 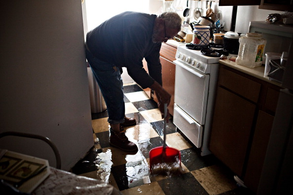 Jolito Ortiz helps sweep water out of his friend's apartment on the Lower East Side while cleaning up after flooding caused by Hurricane Sandy on Oct. 30, 2012. A soldier looks out from his personnel carrier during the landfall of Hurricane Sandy, on Oct. 29, 2012, in the Financial District. A man walks his dog near downed power lines in the wake of Hurricane Sandy on Oct. 30, 2012, in Chevy Chase, Md. People look at a damaged boardwalk Oct. 30, 2012, in the Battery Park neighborhood of Manhattan. Hospital workers evacuate patient Deborah Dadlani from NYU Langone Medical Center during Hurricane Sandy the evening of Oct. 29, 2012, in New York City. More than 200 patients were evacuated from the hospital after backup generators failed because of flooding after a power outage.